In the 2011 season, the San Francisco 49ers went 13-3, qualified for the playoffs, and fell one game short of making the Super Bowl. An interesting stat about the ‘Niners 2011 season was that they had more field goals made than touchdowns scored for the regular season. They were the 62nd NFL team since 1970 to accomplish this feat, and only the 13th such team to make the playoffs in a season when they had more field goals than TDs. Last season we saw two teams, Oakland and Kansas City, have more field goals than touchdowns during the 2012 regular season. The Raiders had 28 TDs and 31 field goals, while the Chiefs had 18 touchdowns and 28 field goals. The remaining 30 NFL teams had more TDs than field goals made. Of the 64 teams that are now in this category (more FGs than TDs in a season since 1970), the 2011 49ers are the only team to win 13 regular-season games in that season. Following are the 13 NFL teams since 1970 that had more field goals than touchdowns in a season when they made the playoffs. * Of the 64 teams that had more FGs than TDs in a season, only 16 (25 percent) finished the season at .500 or above. * The 44 field goals made in 2011 by the 49ers were the most FGs made by a team that had more FGs than TDs in a season. The Arizona Cardinals in 2005 had 43 field goals (and only 26 TDs) to rank second in that category. * The 2011 49ers were a plus-nine in FGs over TDs (44 FGs/35 TDs). That was the ninth time since 1970 that a team had a plus-nine (or more) in that category in a season. 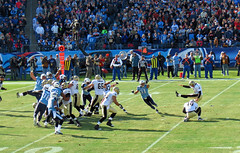 Kansas City in 2012 became the tenth team in this category when they had 10 more field goals than touchdowns. Arizona’s plus-17 (43 FGs/26 TDs) in 2005 is the largest disparity of FGs to TDs in a season since 1970. * The last season where no teams had more FGs than TDs was in 2006.